on 10 March 2015 from 5.30 to 7.00 PM in Cruciform Lecture Theatre 1. All welcome, but please secure your place via Eventbrite. 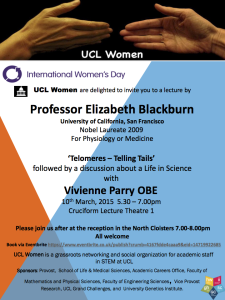 This entry was posted in Events, International Women's Day and tagged Elizabeth Blackburn, Vivienne Parry. Bookmark the permalink.